Please note that the Library is for the use of all patrons. 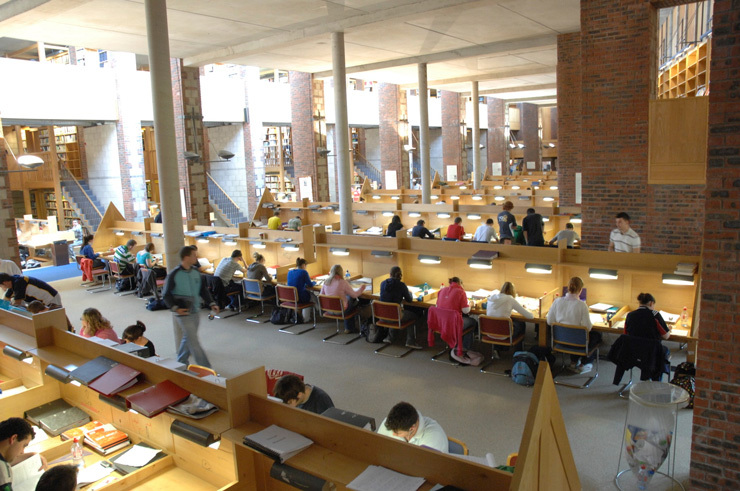 Students will at all times refrain from causing nuisance or disturbance to other Library users. 1. Student I.D. cards are necessary to enter the Library. Failure to produce a student I.D. card will result in refusal of entry. 2. Students must show your ID-Card to any member of Library Staff when asked to do so at any time when you are in the Library. Failure to do so may mean suspension from the Library. 3. Please respect your fellow students and refrain from making noise or talking in the Library. You will be asked to leave the Library if silence is not observed. Your Library privileges may be revoked if you repeatedly break this rule. 4. Eating and drinking are not permitted in the Library. Fines are in place for anyone in breach of this rule. Anyone found smoking in the Library will be subjected to the Student Disciplinary Procedure. 5. All mobile phones should be turned to silent before entering the Library. Fines are in place for anyone found talking on a mobile phone. 6. Using any devices to take unauthorised photographs or recordings in the Library is prohibited. If found in breach of this policy Library services can be withdrawn and students may face disciplinary action. 7. The vandalising or defacing of Library property, books, chairs, furniture etc. will be dealt with severely and you may risk expulsion from the Institute if you purposely damage such material. 8. Please note that littering is an anti-social behaviour and fines are in place for anyone in violation of the rule. Please dispose of any litter that you may have in any of the bins located throughout the Library. 10. You are responsible for making sure that you have no unauthorised Library material with you when you leave the Library. Setting off the Library alarm incurs an automatic fine and stays permanently on your Library account. Setting off the alarm a second time will mean suspension from the Library and possible expulsion from the Institute. 11. If you are leaving your desk for more than 15 minutes, please remove your books so that another patron may use it in your absence. 12. Anyone not using the Library for proper bona fide academic purposes may be asked to leave at any time and have further sanctions applied. 'Please familiarise yourself with these regulations and comply in every way with the spirit of them, thus contributing to an environment which promotes study and research, free from unnecessary distractions and disturbance'.